More than double the capacity of most fuel cans, the GC-15R offers the convenience of using a pump to distribute fuel while also providing a safe means to store fuel. With a tilt back style of mobility, the two semi-pneumatic tires allow the tank to be easily moved around a garage or shop. The bi-directional pump allows fuel reclaiming from other tanks by simply rotating the pump counter-clockwise. Bright red powder coated finish indicates flammable fuels visually. Perfect for the shop that does mostly gasoline service work, but also has a few diesel engines to service or supply fuel too. The GC-15G is easy to manuever around the shop or garage and the pump works great with Diesel fuel for years. Our GC-B is our multi-use caddy. Painted blue, it can be used for Mixed Fuels, Kerosene, Light Weight Oil, Coolants, and fluids like transmission or wiper fluid. 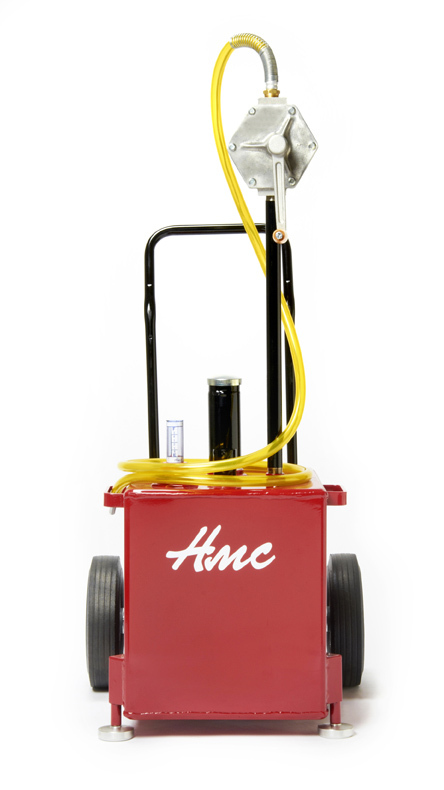 The 15 gallon tank is perfect for shops working on small 2 cycle engines like chain saws, blowers, and push mowers. Box Size 30" x 23" x 22"